One of the great modern TV comedies is the brilliant HBO IT nerd series, Silicon Valley, which pits a quartet of socially awkward coders into the high finance environment of tech world; one of the show’s highlights is the ongoing presence and performance of Kumail Nanjiani – a foil, and a star at the same time on that consistently stellar series. Now, with the chance to share part of his life story on screen, he has teamed with his wife Emily Gordon to pen the screenplay for The Big Sick, a wonderfully realised and emotionally honest portrayal of their romance, interrupted by cultural constraints and medical woes. The film is one which plays into the notions of worlds colliding, and the dilemma faced by those from traditional “eastern” cultures who have to somehow blend in to a world where such notions as arranged marriages aren’t part of the cultural deal. Kumail Nanjiani plays “Kumail Nanjiani”, a Pakistani immigrant (who blessedly brings with him from his homeland a love of cricket — which is a challenge when you try to explain it to Americans, believe me) trying to break into stand-up while ignoring his traditionalist parents’ attempts to wed him to another local Pakistani girl. Within the family is the dilemma of those who move from one culture to another – to maintain traditions of the homeland while having left the homeland behind. That notion within the framework of a film is solid enough; but given that this story is based on true-to-life events, the addition of “Emily” (Zoe Kazan here, and she’s great) getting gravely ill adds a further dimension to the tale, with her parents (Ray Romano, and the ever superb Holly Hunter) coming into the picture, and at first being wary of this emotionally distant lad who has hurt their daughter’s feelings, and the true human underneath it all who is emerging as someone who genuinely cares and has a heart of gold. 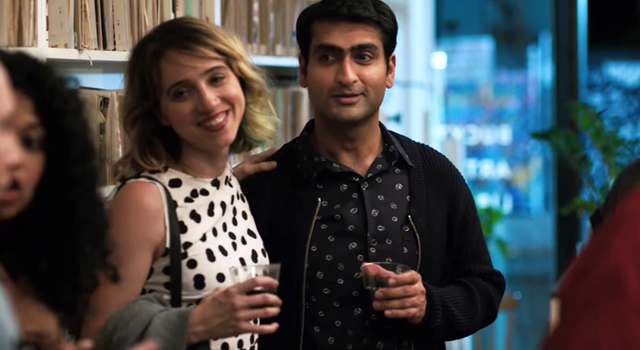 Like any dressed-up autobiography, The Big Sick signposts where it’s headed, and of course, part of the dressing up is that things seem to happen very neatly and can be expressed within the confines of a feature film. But the emotional honesty Nanjiani displays is very touching, and the story which unfolds has a simple truth to it which is nothing short of endearing.